Another PayPal phishing email has been caught by filters stating “Your PayPal Account Will Be Closed in 24 Hours!!”. The email advises that your account has been limited and prompts you to confirm your information to regain access. This particular phishing email even includes FAQ style questions to trick you into believing it is legitimate. If you receive this email delete it immediately. PayPal will never send you emails demanding urgent action for you to provide account information. Please refer to Figure A for a copy of the email in question. It uses PayPal branding including the logo and email template. The sender is said to be “PayPal” whilst using an email address not associated with PayPal which is still misleading at first glance. The subject line is demanding and used to scare the reader “Your PayPal Account Will Be Closed in 24 Hours!!”. It contains a non-personalised greeting which addresses the PayPal customer. Also note the poor use of grammar which is a clear indication of a phishing email. As PayPal is a leading e-commerce payment platform, it’s extremely unlikely it would let an email go out to the public with so many errors as displayed here. There is one main call-to-action link in this email which prompts a reader to confirm your information while also providing steps on how the process works. In the figure you will also notice two supporting anchor text links which are put in place so the email seems more legitimate. Clicking on any of these links could put you at risk; delete the email immediately or report it to PayPal here: [email protected]. PayPal provide useful information on PayPal specific phishing emails which can help you if you are ever in doubt when receiving an email from them. 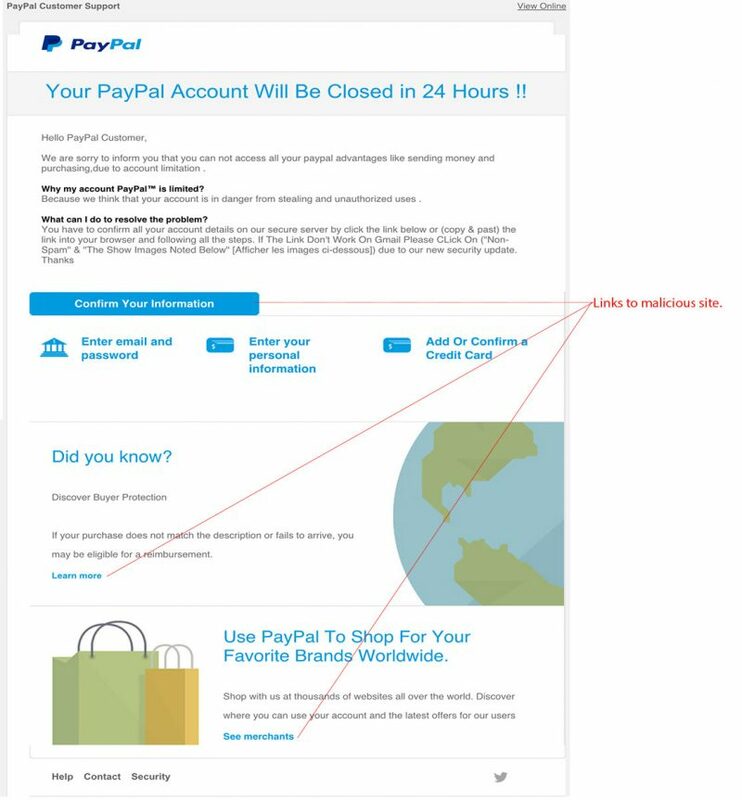 This email contains clear signs it is fake such as the email address, demanding nature, grammar and the links which do not direct to the official PayPal site (you can usually see this by hovering over the link with your mouse or holding the link on your phone before opening). Do not click on any links in such emails or any other emails with similar fake signs you may come across.